Preparing for Year 1 can be done in various ways. One can study ahead of time and get everything ready. ~ OR ~ One can learn about one or two aspects of a Charlotte Mason education and begin applying just that portion while they begin learning about another portion. Feel free to read one section at a time, and read in any order you feel is right for you. The Nature Study and the Bible sections are probably the most lengthy - and contain a lot of bits and pieces to choose from. In the meantime, you can begin getting your children out into nature right away, and reading the Bible is valuable even before learning about Charlotte Mason philosophies and methods. 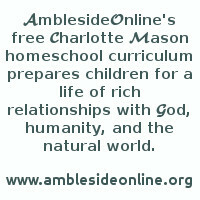 So why would one learn about Charlotte Mason methods if you can benefit without them? It is just that when Charlotte Mason philosophies and methods are applied to the great outdoors, to Bible study, in training children, and in all areas of academics, the benefits your children receive during these activities are amplified tremendously. It is hoped that these notes give you some help in learning about those philosophies and methods along the way. You can read about this most important aspect of Charlotte Mason education in volume 1 here and here. There is more said about habit training and its application in education throughout Charlotte Mason's six volume series, but this is an excellent start. Read Charlotte Mason's chapter from volume 1. My favorite assignment tracker for AO Yr-1 (schedule of readings and assignments by week) can be found on yahoogroups. After joining, go to the file section, click on AmblesideOnlineSchedules, then on Yr-1 schedules, then on Term Schedules, then open up one term's schedule as either a Word document or a pdf file. The assignment portion of these files can be printed out on two pages, so the whole term can be seen at a glance. This is very handy for many of us, and I recommend that you at least consider it. Review and timeline entries on Fridays. More Links and specifics about Bible below. Miss Mason and the Parents Review articles say a lot about nature study elsewhere, but this link, from volume 1, has something to say about much of her philosophy regarding nature study. The AO Advisory encourages families to study a given nature study topic (such as birds, plants, rocks, etc.) during each term. Since Yr-1 contains the Burgess Bird Book, it makes sense to begin with ornithology - but if you are studying something else with (another) student(s), OR there is a subject that is on your heart (like your dog is about to give birth to puppies so you want to study animals/mammals) that is fine. Here is the AO site about nature study. Exploring nature with your child the CM way helps your child to develop visual- and auditory-attention and memory in very specific skills which are later applied to academics (such as letter identification, spelling, composition skills, spatial sense/math, logic and much more). Enjoying nature together increases attention to the world around us while it provides increasingly powerful opportunities to practice the most basic element of written _expression, descriptive composition. All the while, nature itself is nurturing your child's entire body, mind and even his soul (Romans 1). Parents are encouraged to begin nature study right away, but are also encourated to study Miss Mason's approach to this incredibly productive life style. James Herriot's Treasury for Children by James Herriot can be borrowed from most local libraries as individual stories if that works better for you. These stories bring lots of oooo's and ahhh's from my younger sons and are sure to please my daughter in the future. The basic strokes of letters are best learned by writing in sand in sand boxes, cornmeal in pans, chalk and/or marker boards and magnet writers. In this way, mistakes are easily rubbed or dusted out, and fresh starts are more promising. The tactile experience is also positive in the development of writing skills. Miss Mason recognized that older siblings can teach younger siblings to recognize letters and to write them in sand during their playtime together, which is very healthy. If you have an only child, it is more difficult for a parent to replicate the playful attitude of a child, though some parents find this to be possible. Pushing a young child to write is not to be recommended. There is plenty of time later for those lessons to be learned. The earliest real copywork in the Charlotte Mason methods plural would be copying the formation of letters (first with the above materials, and later with pencil and paper), which Miss Mason felt could be done by the youngest of children without damage, even though she was quite hesitant to endorse the ideas of having very young children learn to read. The second earliest type of copywork in the Charlotte Mason methods plural would be word building followed by the first Charlotte Mason styled reading/spelling lessons using something akin to magnet letters of today. If you have not already purchased magnet letters and decide to purchase some, dollar stores often carry them very inexpensively - which is a significant plus. The letters I recommend most highly would be the letters that have magnetic strip covering the entire back surface of the letters. When they are placed on magnet writers, they 'write' for the child, and the child can trace on them with her fingers and her magnet writing pen too. Rainbow Resources has carried these in the past, and they can be found elsewhere as well. For actual penmanship studies the Charlotte Mason way, Mrs. Bridges fits the concepts of Miss Mason's philosophy best in many ways. It is free and online as an html page or pdf file. The one fontware that I know of with a similar font to Mrs. Bridges New Handwriting can be found at EducationalFontware. To understand Miss Mason's philosophy behind the method as well as why she would adopt such a handwriting style is to begin on the most effective footing. You can read about her guidance about penmanship and copywork in volume 1, pp. 233-240. The AO Advisory has made various recommendations for reading and phonics instruction. None of the fully line up with Charlotte Mason philosophy but have been used successfully by many families throughout the years. Efforts to develop a fully Charlotte Mason method are underway. You can read what Miss Mason had to say about children's early reading and spelling experiences in volume 1. Harvey Bluedorn has written an intriguing article discussing historical math pedagogical practice - or - waiting to teach children math in formal settings until they are 10 years of age. His article can be found here. In essence, I would purchase curriculum early as a reference point if I was concerned about scope and sequence (due to a husband's concern, my own concerns, or standardized test concerns - or to reference for teaching techniques which can be applied as a child asks questions), then I would teach the child concepts, skills, and fluidity of application of skills using real life, living books, and games. This would continue until about 10 years of age, at which time cirriculum would be referenced more readily, though living books would be the greater focus for learning. Julie, of LivingMathForum (the creator of livingmath.net) has seen her younger children grow with math naturally simply while being exposed to a life of math books, talk and play. At one point, Julie noticed her young daughter (5 or 6 years of age perhaps) had pulled out the Math-U-See workbooks sitting around and finished a whole work book in a few hours over the course of two days. There is something to this approach. Many moms purchase foreign language curriculum. I don't have strong recommendations in that area. At times homeschool moms discuss the fact that Miss Mason emphasized French first. There could be many reasons for this, but in the end, Miss Mason encouraged the study of other languages as well. In the files' section of my journal site: http://groups.yahoo.com/group/AmbleLore/ there is a file that discusses what I have learned thus far from studying Charlotte Mason's various volumes as well as Parents Review articles (of which Miss Mason was the editor): Read How to Learn a Language; The Teaching of Reading with methods suggested by Gouin; Beginning Modern Foreign Languages. In essence, I believe that borrowing tapes from the library in order to access the accent of a given language is efficient use of time. During that time, a little knowledge will likely be gained, but for many families, the serious language studies will not occur until after the accent has begun to fall in place. d) learn to work with active verbs in a playful setting (begin with commands: 'Sit!' 'Walk!' 'Hop! ', etc., and then move to 'He sits.' or 'He sat.' and etc. until basic conjugations are learned by narrating what happened after a command was given, and then talking through a 'series' of events - there are examples of commands in the Foreign Language file at AmbleLore. It is invaluable to purchase a book devoted to verbs in your target language. They would be kept near foreign language dictionaries in new and used book stores. Instruction by Books.--The instructed conscience knows that Temperance, Chastity, Fortitude, Prudence must rule in the House of Body. But how is the conscience to become instructed? Life brings us many lessons--when we see others do well, conscience approves and learns; when others do ill, conscience condemns. But we want a wider range of knowledge than the life about us affords, and books are our best teachers. There is no nice shade of conduct which is not described or exemplified in the vast treasure-house of literature. History and biography are full of instruction in righteousness; but what is properly called literature, that is, poetry, essays, the drama, and novels, is perhaps the most useful for our moral instruction, because the authors bring their insight to bear in a way they would hesitate to employ when writing about actual persons. Autobiographies, again, often lift the veil, for the writer may make free with himself. In the Bible the lives of men and the history of a nation are told without the reticence which authors are apt to use in telling of the offences of the good or the vices of the bad. Plutarch, perhaps alone among biographers, writes with comparable candour, if not always with equal justice. Grapple them to thy soul with hooks of steel." A thousand thoughts that burn come to us on the wings of verse; and, conceive how our lives would be impoverished were we to awake one day and find that the Psalms had disappeared from the world and from the thoughts of men! Proverbs, too, the words of the wise king and the sayings of the common folk, come to us as if they were auguries; while the essayists deal with conduct and give much delicate instruction, which reaches us the more surely through the charm of their style. So are the Novelists and the Dramatists.--Perhaps the dramatists and novelists have done the most for our teaching; but not the works of every playwright and novelist are good 'for example of life and instruction in manners.' We are safest with those which have lived long enough to become classics; and this, for two reasons. The fact that they have not been allowed to die proves in itself that the authors have that to say, and a way of saying it, which the world cannot do without. In the next place, the older novels and plays deal with conduct, and conduct is our chief concern in life. Modern works of the kind deal largely with emotions, a less wholesome subject of contemplation. Having found the book which has a message for us, let us not be guilty of the folly of saying we have read it. We might as well say we have breakfasted, as if breakfasting on one day should last us for every day! The book that helps us deserves many readings, for assimilation comes by slow degrees. Literature is full of teaching, by precept and example, concerning the management of our physical nature. I shall offer a lesson here and there by way of sample, but no doubt the reader will think of many better teachings; and that is as it should be; the way such teaching should come to us is, here a little and there a little, incidentally, from books which we read for the interest of the story, the beauty of the poem, or the grace of the writing. Charlotte Mason Methods Application to the Study of History: Use of narrations (vol 1 pg 231-233), maps, definitions of difficult words (if you can find the time to pre-read the selections and underline difficult words to preview prior to the reading), pictures of significant characters with their names listed under them [ (which can usually be easily found by using the Google Image search function online but which can at times bring up immodest results), and timelines (here's an easy to print book of the centuries online or consider a different format ~ for other directions for making your own timeline try donnayoung.org or consider making a timeling in MicrosoftWord) --actually, Charlotte Mason used timelines differently than we had thought, but such timeline use is common today - for a look at Charlotte Mason's actual use of Timelines, read this help at DestinationHome] helps children to recall stories over time and to give narrations using proper nouns as the maps and pictures are still posted during the narration. Geography jar: We have also learned that keeping a geography jar helps with occasional review. After reading each story, simply write the title and main character on a slip of paper. Each couple of weeks, ask the child to draw a few slips of paper and tell you where in the world that story happened. Trial & Triumph is written from a protestant world view and is greatly appreciated if that is your mindset. Highly recommended - but these stories usually need to be broken down into at least a couple of shorter reading sessions. Fifty Famous Stories Retold: Are excellent character building stories from around the world. They are also good material for duet reading if the material is printed in large font. Many of these stories are about the common man instead of all being about kings and the aristocracy. Or this mnemonic poem traditionally used by British students. Viking Tales: Two of the Historical Periods represented at Walk Through Time relate to AO Yr-1 material, one being Roman times and the other being Viking times. Biographies: The D'Aulaire books are classics, and wonderful to own, but many parents who feel the need to cut back on purchases use copies from their local libraries, as these selections are read over a short enough period to do so. Miss Mason felt that geography should first be taught out of doors, comparing rivulets and little streams to great rivers which lead to the ocean, hills to mountains, and etc. She also felt that the geography one is exposed to in stories in the area of town and country should be referenced to maps. Miss Mason's intent was for the child to 'see' one or more scenes from a city, or from a story about a city, in his mind's eye when he saw that city represented upon a map. The geography one is exposed to in stories which relates to rivers and mountains she felt strongly should be illustrated by drawing/shaping these geographical figures in the sandbox, and later sketching them on paper. Later, the child was to be able to produce their own rough sketches from memory! Most AmblesideOnline families have not aspired to this, but many do. Read volume 1 pg 72-77, pg 271-278, and pg 218. The AO geography selections as well as nature studies all lend themselves to various aspects of all of these philosophies/methods. Aesop for Children by Milo Winter or Aesop's Fables ~ These are especially good for students who struggle with narration skills. Feel free to read only one sentence at a time before asking for narrations. Stretch that out to two and three sentences, and then to one and two paragraphs, one and two pages, as the child's ability increases. Blue Fairy Book by Andrew Lang often brings up significant discussion at the beginning of each year. Parents are strongly urged to preread these. The content can be more violent than this culture is accustomed to and the fairy tale aspect comes under scrutiny of many Christians. Food for thought as you decide what is appropriate can be gleaned by doing an online search for "The Ethics of Elfland" by G. K. Chesterton. If this article does not sway you to use the Blue Fairy Book, the other options listed in the Yr-1 booklist (Pyle's Wonderclock and Anderson Fairy Tales) are wonderful as well. Parables of Nature by Margaret Gatty are probably the most difficult reading assigned to Yr-1 students. We have read these, though we have gotten behind at times because I didn't want to hear the AmbleGrumbles. In the end, by breaking these stories down into smaller portions, my children have worked their minds around these stories and smile happily at remembering stories they have heard in the past. Today our 10 and 8 yo sons are better able to enjoy literature than most of their 12 and 11 yo friends, simply because they have exercised their minds with ideas in literary form. This is the magic of Charlotte Mason. Some families have put off reading these stories for as many as two to three years, which is a good option for some families, but if you can help your children work their hearts and minds around these rich and insightful stories, not only will their character be built up with great ideas, but they will be a little more prepared for the jump from Yr-3 to Yr-4 in the future. Miss Mason herself recommended Twelfth Night as an excellent first story for children - which is therefore, of course, an excellent first choice. Prereading is helpful as time permits. Lightly underlining words which might need to be previewed allows the parent to preview vocabulary before the reading. Stopping periodically to allow the child to give narrations is invaluable, though some students who struggle to give narrations for Aesop's fables might be excused from narrating these for a season. Giving narrations as an example to your child is also valuable. Some stories actually occurred in real places. Referencing an atlas, map or globe is in line with Charlotte Mason philosophy. To my understanding, Elizabethan actors usually did not dress in 'period garb', but you can do as you like.......... as time permits. Poetry is to be read and enjoyed. Bedtime, schooltime, tea time are especially great times to enjoy poetry together. Poetry is also to be learned. See recitation in regards to memorizing poetry. In my humble opinion, Monart is tops, hands down. Though Miss Mason discouraged young children being asked to learn to draw when they were young, many years after Miss Mason's era of influence Mona Brooks applied many of Miss Mason's own philosophies to children in this area. IMHO, Miss Mason might have actually approved of Mona Brooks's ideas if she had read them, though no one knows for certain. Our family has enjoyed learning new hymns, folksongs and foreign language songs while prepring breakfast and cleaning up the kitchen after breakfast. Later, we enjoy sharing these during family worship, in group sing-a-longs when local families from our church get together one Sunday each month, as well as for larger family get togethers. Obviously, a Yr-1 student would not be able to do all of the following in one day. It might be more important to let some of these go to cover more ground for most of our students. If there are children who struggle with learning and remembering stories, one might use quite a few of the following ideas and 'camp out' with a given story for a while." and possibly also precede all of that with "For most of us, doing the all of the following is a full time job - and is simply not practical. However, using as many as fit your family's needs and your lifestyle will prove beneficial. --The AO Advisory recommends using the KJV to help develop a literary relationship with scripture. You can read their own words in this matter in Lynn Bruce's article, Why the KJV? --Miss Mason taught that previewing new vocabulary prior to the reading allows the reading to speak for itself and for each reading to enter the child's mind uninterrupted. As time allows, pre-reading material and lightly underlining words which should be previewed helps this portion of the lesson move smoothly. The first dictionary published in the US can be found online here. It's Biblical references and insightful definitions contrast significantly at times with today's dictionary entries. As time permits, this can prove more than useful. --Asking for a narration during or after a reading helps the child's mind attend more fully. Begin by having your child tell back the story. If this is difficult, read only one sentence at a time, and ask him to tell you about each sentence in turn. Lengthen the amount you read between narrations as his ability to attend and organize his thoughts increases. (Miss Mason on narrations from volume 1. Penny Gardner recommends the use of a narration cube, which you could make at home if you prefer. Narration jars have been used by many AO moms - various styles of narration are written on slips of paper and then one slip is drawn out for each narration. Narration types might include - Tell the story back in your own words. No narration this time! Draw a picture from the story and tell me a little bit about it. What was your favorite part of the story? etc. If your child struggles with using proper names, this might help http://groups.yahoo.com/group/AmbleLore/message/72 ). --actually, Charlotte Mason used timelines differently than we had thought, but such timeline use is common today - for a look at Charlotte Mason's actual use of Timelines, read here. --and illustrating with great art were integral parts of a Charlotte Mason approach to the Bible. - keeping in mind that artists often used nudes and that not all art illustrates Biblical stories totally in keeping with the Biblical account - so use discretion in line with your convictions. Try here and here. --Generally speaking, Miss Mason did not want the teacher's comments to be the lesson content. Instead, helping with vocabulary, geographical and cultural understanding briefly, making a brief comment to wet the child's appetite for the coming story, well timed and brief questions to help the child think for himself, an occasional comment to summarize or bring the students' attention to important ideas, brief comments on the students' narration, and surprisingly an occasional child-friendly lecture were appropriate, but mostly, the Biblical text was to speak for itself. --Recitation: Charlotte Mason did encourage Bible memory, which is included in the recitation section below. --Singing Praise to God: Charlotte Mason did encourage the study of hymns, which is listed below. -Coloring pages. Some moms allow their children to color these during the Bible story reading time. Here are some from Calvary Chapel. -Simple Bible costume ideas can be found here. -for moms who want to do all of the creative extras that we don't do a lot of, try daniellesplace or Dovescot Sunday School. Charlotte Mason used texts by J. Patterson Smyth for her class Bible time. You can see what one of those was like by viewing a sample of the text. --Burgess Bird Book - read aloud and take narrations, if you have time and if your child is comfortable with the process of having his narrations written down or typed, they can be written or printed onto the back of coloring pages to put together a wonderful keepsake. Another option to consider would be listing the names of birds you have read about on a chart that shows various types of habitat (rivers, lakes, woods, human habitations, etc.) To get a general idea of which birds are local to your area and when they are there, you can check the links here: http://groups.yahoo.com/group/AmbleLore/message/77 ~ helps for chapter I can be found here http://groups.yahoo.com/group/AmbleLore/message/95 and helps for chapter XI can be found here: http://groups.yahoo.com/group/AmbleLore/message/118 . and a pdf coloring book at Cornell Labaratory of Ornithology. Free bird coloring book from Cornell 50Birds: Calendars and coloring sheets with birds or animals on them. --Backyard birding guidance: beginning info for attracting birds and feeding them can be found here: http://groups.yahoo.com/group/AmbleLore/message/88. --A great Lesson on Feathers can be found here: http://groups.yahoo.com/group/AmbleLore/message/141 . --Contacting the local birding enthusiasts can bring a heightened awareness of the various habitats near you, and sometimes you can even find an enthusiast who would be willing to help you learn about more birds than you can learn on your own. --Nature Centers are also a wealth of information. -----from the yr-1 page Rod and Staff has bird pictures in their Nature to Color coloring book.